To shop online, you need a debit or a credit card, but do you know how to use one? Although most online stores are easy to use, you may want a quick guide. This article is the guide you need. You will see what a debit card looks like and what the different parts represent. You will also discover the features you need to shop online. In case you are wondering, your ATM card is a debit card and you can shop online with it if supported by an online store. Most cards we use in Nigeria are debit cards. 1. EMV Chip: This has a chip that contains your banking details. It helps automate your offline transaction like at ATM machines and PoS terminals. It plays no role in online shopping. 2. Arrow Head: This arrow indicates the direction for slotting in the debit card into an ATM Machine, a PoS terminal, or an EFT terminal. Debit Cards are usually slotted in with the side with the arrow facing up. 3. 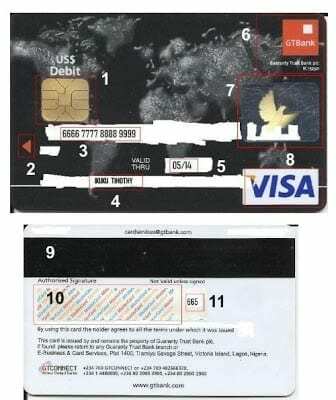 Card Number: This is usually a 16 digit number. This number should be entered into the appropriate field during checkout at an online store. Never send this number to anyone via email, BBM, or 2go. Never enter this number on an online store you do not trust. Note that anybody with knowledge of this number is a few steps away from shopping with your debit card without your consent. 5. Expiration Date of card: Indicates when the debit card will expire. Usually at the end of the month indicated. A new debit card will usually be sent to you before the end of the expiry date. 10. Signature Strip: Sign your signature here. Used for offline transactions at PoS terminals. 11. CVV: This is usually a 3 digit number at the back of your debit card. It is a security code and stands for Card Verification Value. Anyone with this number is very close to making unauthorised online payments with your card. So, safeguard it.